← Tip of the Week – Are You Prepared for a Disaster? 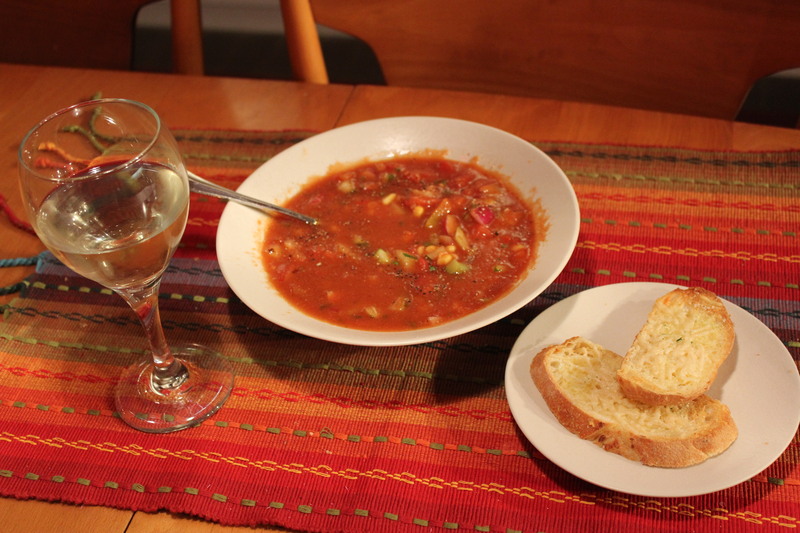 Some of you may remember a recent posting for my recipe for gazpacho. It is truly a refreshing soup and a great way to take advantage of the wonderful veggies now in season, but I will admit that it does take some time to prepare. 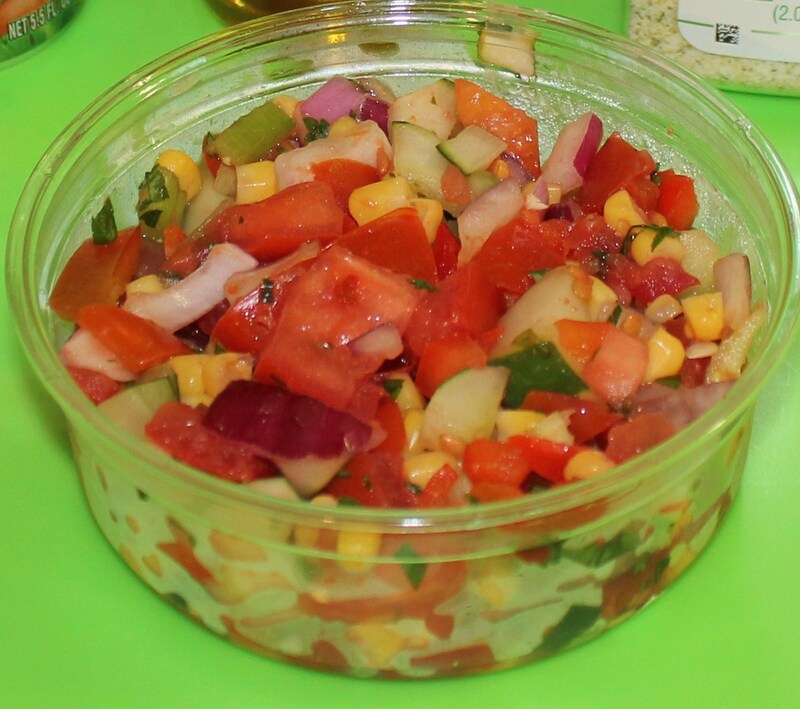 Just recently I stumbled upon a gazpacho salad at Whole Foods Market (note – I need to add this to my list of favorite store-bought salads). 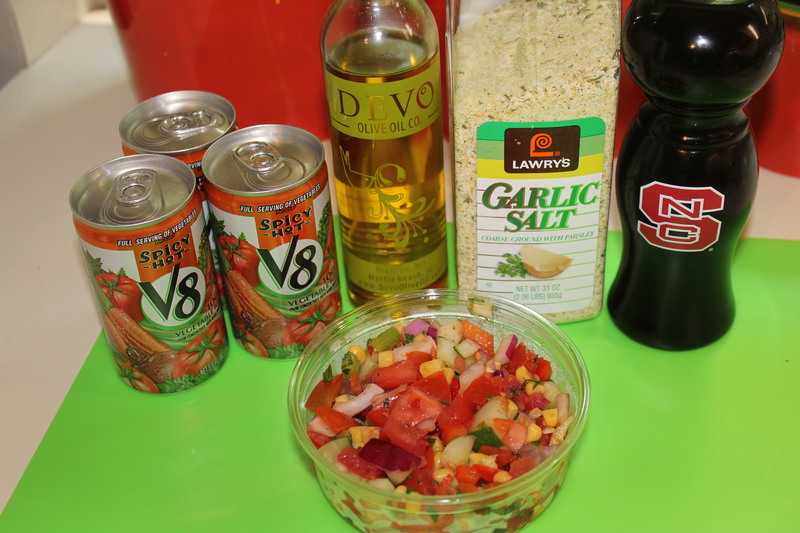 It occurred to me that maybe I could use it as the base of a good gazpacho by adding just a few ingredients. 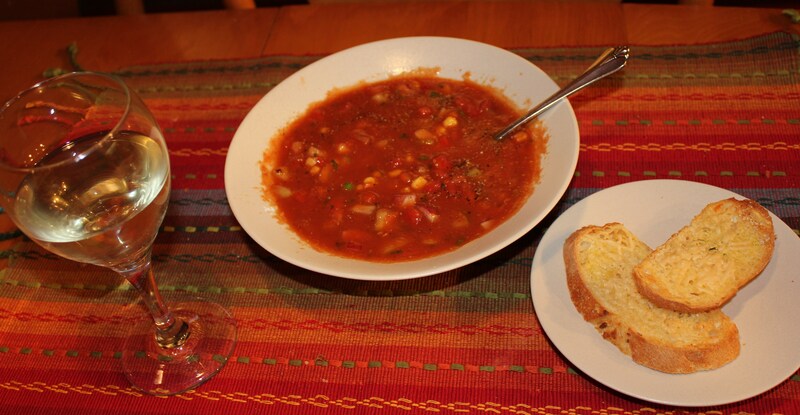 And I was right – while I still prefer my own gazpacho, this is quite tasty and is a great time saver! I think the gazpacho salad ($6.99/lb.) from Whole Foods is a seasonal offering, only available in the summer when the veggies are at their ripest. It contains tomatoes, parsley, cilantro, red peppers, celery, corn, cucumbers, lime juice, sesame oil, water, tamari, mint, ginger, maple syrup, crushed red pepper, salt and black pepper. Yummy by itself, yummier in this soup! 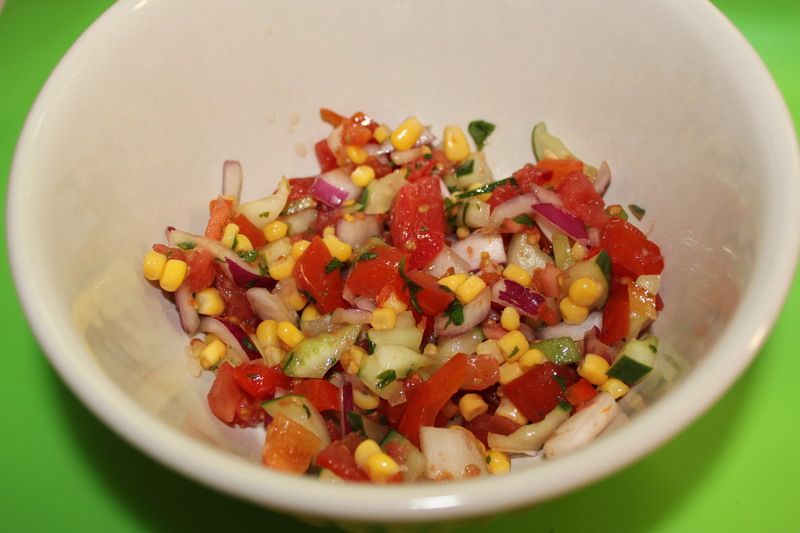 Place the gazpacho salad in a medium-sized, nonreactive bowl. Add the Spicy Hot V-8 juice, olive oil and seasonings. Mix together and refrigerate for a few hours to let the flavors intensify. Serve with some garlic cheese bread or a mixed-green salad and a glass of wine for a light and refreshing meal. If you have the time to spend then by all means make my recipe – you’ll be glad you did. 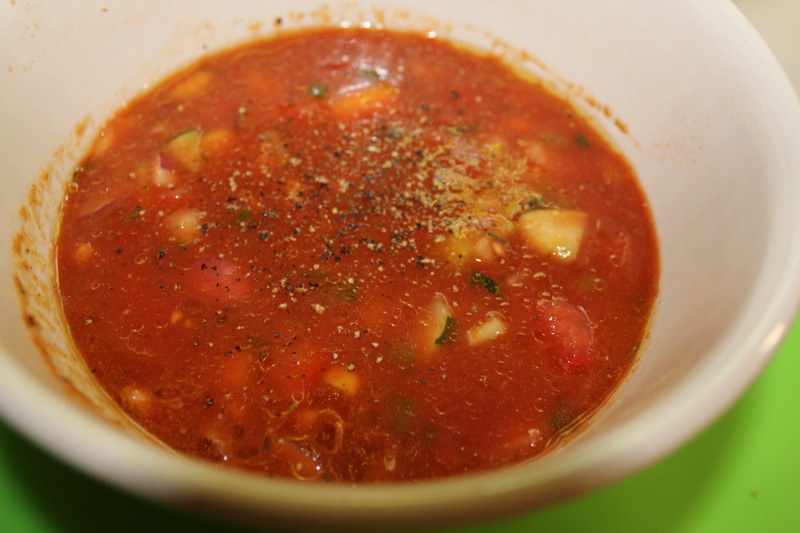 But if you are crunched for time or only want to make a small batch of gazpacho, this is a great alternative. This entry was posted in Recipes, Soups and Such, Vegetables/Vegetarian/Vegan. Bookmark the permalink.